Territorial Army Officer Recruitment 2019 (प्रादेशिक सेना अधिकारी भर्ती 2019- टीए सेना भारती- ऑनलाइन आवेदन करें) Indian Army invited the young and energetic candidates for a gainful opportunity as a Territorial Army Officer Vacancy. Candidates who wish to work with Indian Army Organization then go to the official website of TA Army and fill the Territorial Army Officer Application Form 2019 via Online Mode. The application process will start soon on the official website. Yet, the total number of vacancies have not been announced. Candidates can check the directly Territorial Army Officer Notification details from here along with the eligibility, selection process, pay scale, etc. you can also get the Latest TA Army Bharti information. Latest Update: Indian Territorial Army is going to release the Army Officer recruitment 2019 notification for various vacancies. Interested candidates can fill the online application form before the last date from here. Indian Army is one of the largest security forces in India. Every year Indian Army releases various employment notifications for numerous job posts. Recently it has released the TA Army Rally Bharti Notification 2019 for Officer Posts. You can check their eligibility and can fill the application form via Territorial Army Recruitment Apply Online. As per the official notification, TA Bharti Rally process is going to be conducted in the upcoming months. For more information in regards to Territorial Army Officer Recruitment education qualification, age limit, pay scale, etc go through this article and get the complete details. Candidates must be Graduate from any recognized University/ college/ institutes with good academic marks. Candidate’s age must be in between 18 to 42 years on the date of application. Candidates should be paid the application fee via online mode. Candidates must notice that fee once paid shall not be refundable under any circumstances nor can the fee be held in reserve for any other examination or selection. Candidates need to visit the official web portal on Indian Army. The applicants must ensure that while filling their Application Form, they are providing their valid and active E-mail IDs. While filling in the Application Form, the candidate should carefully decide about his choice for the center for the examination. Candidates should note that no request for change of center will be granted. Candidates in their own interest are advised to keep a copy of the print out of filled form submitted online. 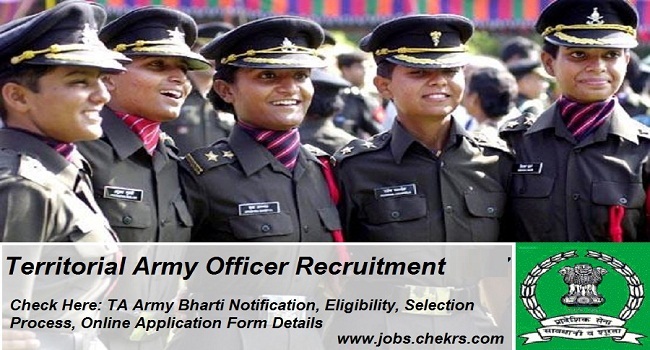 To more Latest Alerts on TA Army Rally Bharti 2019 keep visiting our site www.jobs.chekrs.com. You can also check here the information related to the latest Territorial Army Vacancy 2019. In the case of any query, you can put your comments in the commenting section below and we will revert you in a short while. You can also bookmark our page and get the latest alert on army jobs.